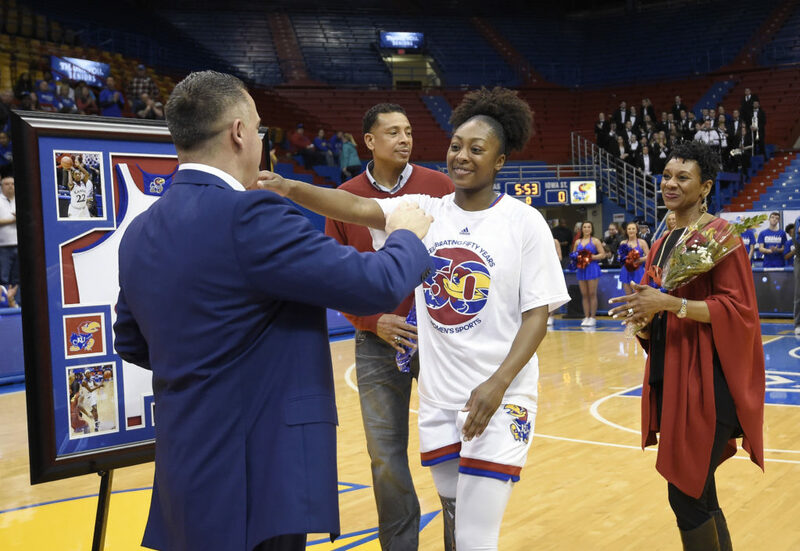 Kansas forward Chayla Cheadle hugs coach Brandon Schneider during the senior recognition on Tuesday, Feb. 27, 2018. Iowa State outscored KU 65-56. 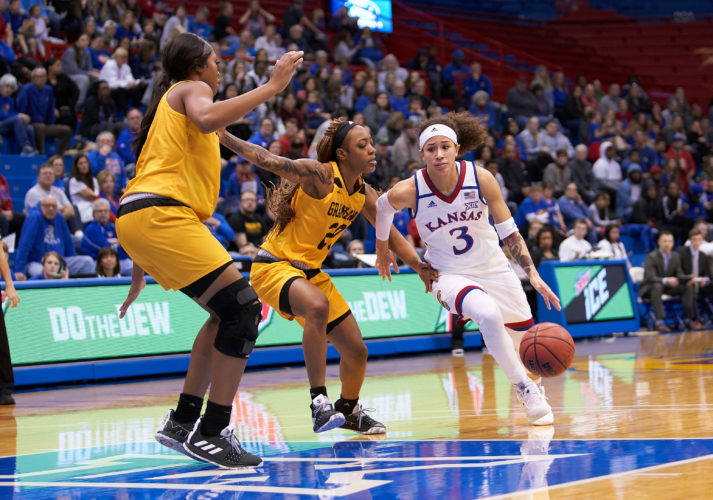 The Kansas women’s basketball team had a promising first half on Senior Night against Iowa State. But in the closing half, the shots rarely fell through the hoop. A cold second-half shooting performance ultimately downed KU in its 65-56 loss to Iowa State Tuesday at Allen Fieldhouse. Schneider said he was initially pleased with the offensive output he saw from his group in a first half in which the Jayhawks shot 13 of 26 (50 percent), carrying a 35-31 lead into halftime. Tyler Johnson was a key contributor in the Jayhawks’ early lead. The 6-foot-2 forward established herself early in the paint and scored 13 points on 5 of 6 shooting in the first half. Johnson’s aggressive play against Iowa State’s frontcourt also helped her get to the free-throw line and make 3 of 4 shots from the stripe. “I thought our guys did a really good job in the first half of playing inside through Tyler,” Schneider said. But Johnson’s offensive production — along with that of the rest of team — went dry in the second half. In the third, KU (12-17, 3-15 in Big 12) was mired in an offensive slump for most of the period. The Jayhawks at one point committed four turnovers in a scoring drought that lasted more than five minutes. The drought also allowed Iowa State to reel off a 13-2 run and take a 6-point lead into the fourth. The Cyclones had made some defensive adjustments on Johnson, and Schneider recognized it. The double teams on Johnson opened up the floor for the Jayhawks, but they couldn’t capitalize. Austin Richardson, Brianna Osorio and Christalah Lyons combined to shoot 11 of 34, and Kylee Kopatich — known for her sharpshooting — didn’t attempt a 3-pointer on the night. “We had some guys that typically make baskets, or provide us with offense, that just didn’t quite get it done,” Schneider said. As for the senior group of Chayla Cheadle, Eboni Watts and Sydney Benoit, the loss was a disappointing end to their home careers. Cheadle and Benoit both agreed that KU’s upset win over then-No. 25 Oklahoma State last week will remain one of their favorite moments. The Jayhawks will now prepare for the Big 12 Championship, which begins Friday. KU will open up against K-State at Chesapeake Energy Arena in Oklahoma City.